It is hot at the moment in Portland… very hot. 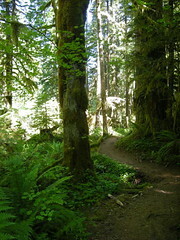 How happy I was when knitter friend Eileen invited me to hike down Salmon river over at the Mount Hood area! 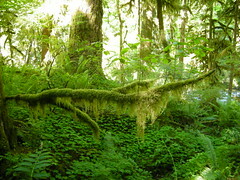 What beautiful nature we are fortunate to dwell in… truly beautiful. And we are so lucky to have this on planet Earth. 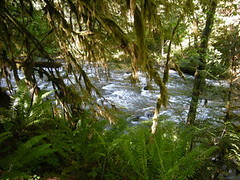 I took the picture while sitting on a rock… and oh my, the energy over there is just so invigorating! Thank you so much my precious friends…nature is truly beautiful. It is a dk weight bamboo by Farmhouse yarns called Bonnie’s Bamboo. The Ivory colorway stole my heart and I quickly cooked up a tunic design with a tiny bit of lace. I know, it is yet another tunic, but you know what? I just love tunics… It really works well for me! I hope this one will turn out satisfactory. This tunic will have a base A-line only with a bit more decreases at the waist. It is going to be an easy, slightly boring knit, but this is just perfect because while knitting this simple project, I am cooking up other designs with bamboo yarn. It is very entertaining to me, I dream away while my knitting needles make that soothing clickety-clack sound. How I love knitting… My word, how I love it. I finished my Bamboo Summer Top… and I am not happy with the outcome. The design may be cute, however, the bamboo fiber I chose to work with is very beautiful but simply not the right fiber for this particulair design. 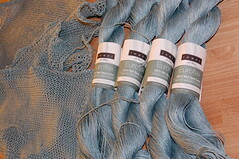 First of all, though I love the color of this bamboo yarn and I loved working with this color. But to actually wear it? Eh, not my cup of tea. Secondly, though it looks kind of cute at first sight, I stronly have the feeling that I am not doing the bamboo any justice. The design is simply too fitted for this beautiful bamboo that so wants to drape! I have the feeling that I am forcing the bamboo into a design in which it simply cannot bloom and be itself. I don’t think I will work with the same orange bamboo again. 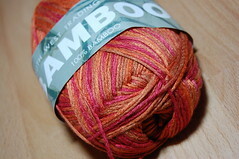 I will choose a different bamboo yarn, with a color that is more suitable for me to wear. What I will do with this particular one I knitted up, you might wonder? Rippit, rippit, rippit… to the frogpond it goes! I have been wearing my Linen Summer Tunic for the past few days now… It feels so good, I just don’t want to take it off! I have been ironing it every single day too so that it shines so beautifully and it looks crisp and tidy! While ironing my top, my eye fell on two balls of yarn that have been living in my stash forever: South West Trading variegated 100% Bamboo…. 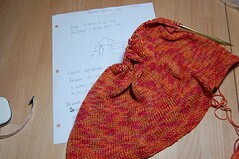 My very first project with this wonderful bamboo yarn was my first feather and fan scarf. Remember this one? I had some of this bamboo leftover AND I had 2 balls of bright orange sitting in my stash. I decided to work with the orange color and I quickly made a swatch with the green leftovers. This bamboo yarn is so delicious to work with… it is buttery soft, lofty, cool to the touch, drapy and oh so shiny. I simply love it and would recommend this yarn for summery tops anytime. 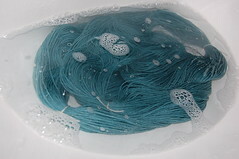 There is an important thing you should know though: this yarn grows in length considerably once you wash it! 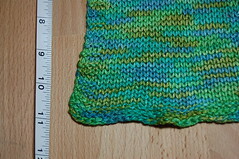 When I knit up my gauge swatch, it was 9.5 inch by 9.5 inch and after washing the dimensions were 8.0 inch by 11 (!) inch. What to make with just two balls of South West Trading Bamboo? I knew immediately what to make with this yarn. I want to make a close fitted and shorter version of my Linen Summer Tunic! First question is: How do you know how much stitches to cast on? This top will be knitted bottom up. As you can see in the drawing, my upper hip circumference is 33 inch. My gauge is 6 stitches to an inch so: 6 stitches x 33 inch = 198 stitches. I round this number to 200. Voila! 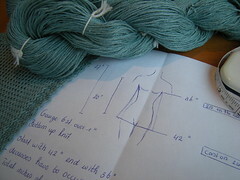 My pattern starts with the following words: Cast on 200 stitches. Second question: You will have to decrease from upper hip to waist. How do you know how much to decrease and with how many intervals? Let’s look at the drawing again. My upper hip measures 33 inch, and my waist measures 28 inch. 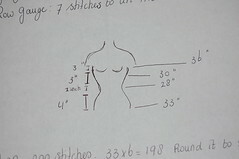 This entails that I have to decrease with (33-28=) 5 inch which equals 30 stitches. I also know that per decrease row I will decrease 4 stitches at a time. So how many rows will I have to decrease in total? 30 divided by 4 = 7.5 I will round this to 7 rows. Knit 3 rows. On the 4th row decrease. Repeat this decrease row 6 more times every 4th row. Anyhoo, I won’t bore you with more math, I just wanted to show you the first steps that I take in writing out a pattern. This one is going to be a real quick one too… I started two days ago with this project and I am already half way! YAY! Pattern: My own design. However, neckline was inspired by Leah Tunic. It only took me 6 days…6 days! I am amazed myself. This wonderful wonderful linen just made me knit on turbospeed and I couldn’t help myself. All I wanted to do is knit. Sweeeet. 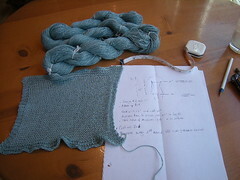 For this little design I actually made the math happen before I started to knit. Rather than have the design organically grow, I wanted to have my figures down so that I would not have to face too much ripping out like with my top “Attitude”. I first measured the circumference of my hips and added 1 inch. Then I measured my chest. I knitted this top from the bottom up and common sense shows me that I needed to decrease from hip to chest with 6 inches (42-36=6). Some more math and calculations showed me that if I wanted the tunic to gradually decrease, I had to make decreases 8 times, every 14th row. Easy peasy. Initially, I wanted to make a deep V-neckline both in front and back. However, once I held the unfinished garment against my body, I quickly noticed that linen wants to drape. So I thought, why not let it be what it wants to be and I decided to shift from V-neckline to softly draped neckline. How great my joy was when I bumped into this Leah Tunic design while perusing the net. 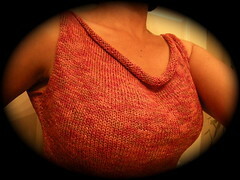 I incorporated the neckline used in the Leah Tunic design, into my own. Thanks so much Purl Bee for sharing this design. 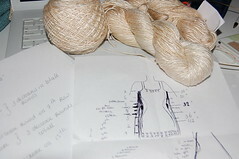 And thanks so much Leah, for giving me inspiration for the neckline! I simply adore linen’s drapey characther. It bounces and flounces so beautifully and one can especially see it at the neckline and at the bottom part of my tunic. I love love love it! After I casted off, I threw my tunic in the washer and then in the dryer. Once out of the dryer I stretched out my garment vertically. You see, I wanted my stitches to elongate… Linen seems to be so pretty that way. Finally, I ironed my tunic making sure pulling the garment even more vertically. I can wear this tunic with some pants, I can wear it as a beach dress over my bikini and I can wear it as a nightie. I wish you all could feel how deliciously it caresses the skin… sigh. Great for hot weather! I am very happy with the outcome of this casual and leisurely garment! For the past few days, I have been playing around with Euroflax Linen. What fun we had together! You all know by now that I love to make swatches. 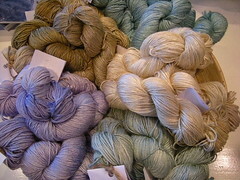 I want to get to know the yarn better, feel and see its character. Often times, I just make a swatch and then put it aside because my curiosity has been satisfied and it stops right there. But every now and then, I am truly encaptured by a yarn. Euroflax is one of those yarns… it truly speaks to me… in a very seductive manner. 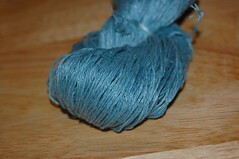 Me and Euroflax Linen have been fooling around for the last few days. I have knitted several swatches with different needle sizes. I also have washed the swatches several times and tossed them in the dryer several times… oh, it is just amazing how soft and pretty it comes out! I held the swatches close to my body, see how it behaves… I danced with my swatches, just to see how it bounces and flounces… I stroked it gently and am amazed by its sheen and softness. Dear reader, I am in love. 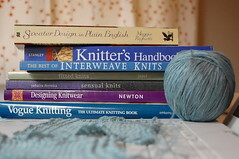 Then comes the stage of phantasizing about what to make with this yarn… I have cracked my brain, flipped through several books and searched through numerous magazines. A kimono? A dolman type sweater? Maybe a tanktop? Long sleeves? Short sleeves? Finally, I decided to make a A-line loose fitted tunic, with deep V-neck and no sleeves. I want it to bounce and flounce around my body! So to the drawing table it goes and do the math to determine how much to cast on, where to decrease, where to cast off for armhole shaping and shaping of the deep V-neck. And when the figures all line up and all makes sense, I just want to do a happy dance. Hargreave’s design are timeless and so very classy as always. 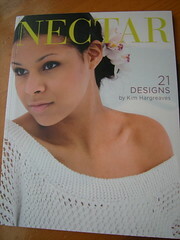 She is one of my favorite knitwear designers. The one design that stole my heart is called Jasmine. I love it so much and seriously want to knit it! First of all thank you so much for all the nice comments on my top “Attitude”. It is so incredibly rewarding and so nice to receive compliments from other knitters! Can I at least play with some yarn, then? Make a swatch? And just dream? I have never ever given it any thought. I have touched it, arranged it neatly in the yarnshop, sold it to costumers but never ever was I interested myself. That is untill yesterday. When I passed by it, it just talked to me. I picked up a little skein and I just had to take it home with me! At first this Euroflax by Louet seemed a bit harsh to the touch, but once washed with a bit of conditioner and then thrown in the dryer (yes, you read that correctly, just toss it in the dryer) with some fabric softener sheets, it is just fine to work with. And the sheen… it has a beautiful sheen to it! Ah… this stage in the creative process I like almost the best. 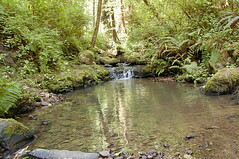 Nothing is set in stone yet, all is still fluid and the possibilities plentiful. What size needles to use for my swatches? Recommended needle size #2 to #3 or use a much bigger needle for a more open knit? 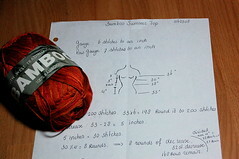 What garment comes to mind when knitting up my swatch? Tanktop? Tunic? Short sleeves? Long sleeves? Or no sleeves at all? All I know at this stage is that I want a summery garment with an fairly open knit so that it will let in cool Summer breezes! Oh the thought of feeling the coolness of linen on my skin during a hot Summer’s day! I want a garment that hangs freely and relaxed on my body, no tightness, no fittednes. It will be a leisurely garment, that has room for movement and of course it must have that elegant and feminine touch. Mandatory. My, my… It sure has been a journey with this one! Because of all the attitude this top gave me, I accordingly named her “Attitude”. Readers who have been frequenting this blog for a while, might remember it all started lasted november when I had an idea for a top design. 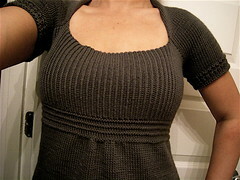 My design was inspired by Cassie Rovitti’s Tubey Sweater as seen on Knitty.com. Ooff, all the ripping back that I had to do… numerous times! I am so glad to finalize this project… It took me a long time to finish it! If you want to read all entries on this project click here. Yay, I am so proud of myself! Thanks for sticking with me on this one everybody… and thanks you so much for your tips and encouraging words. I really appreciate that, you all kept me going. You are currently browsing the Getting Purly With It blog archives for June, 2008.